The Modern Soul of the album’s title is Polish and it’s enshrined here in four violin sonatas, only two of which are written for violin and piano. The music is all new, composed in the years 2013-15 and recorded early in 2016. Each of the four composers has something individual to offer. Ignacy Zelewski is the youngest of the composing quartet and his violin sonata, cast in four conventional movements, offers a ground plan of taut, terse brooding melancholia in its opening, but gathering tension via toccata-like drive; some Prokofiev-leaning in fact and in the brisk lively Scherzo there are Bartókian echoes. Though the finale can be abrasive the Chorale elements are especially attractive. This is a work set firmly in the august sonata lineage. Marcin Markowicz also writes for violin and piano. His two-movement 2015 sonata enshrines little mystic bell-like chimes and patterns of extreme delicacy that one could infer derive from an immersion in Arvo Pärt’s music. Flourishing rather more agitatedly the music soon settles again, whilst the second movement corrals incidents reminiscent of both Bartók and Shostakovich. Cast for violin and guitar, Aleksander Nowak’s Sonata in Three Moods is framed in a single movement. I like sleeve note writer Marcin Trzęsiok’s description of this work as possessing ‘boneless fluidity’ and this manifests itself in limpid and flexible expression. Perhaps surprisingly there are some Scottish hues via a fairly straight reminiscence of the traditional song Wind and Rain before some rather jazzy figuration ends this very lissom and engaging piece. The combination of violin and accordion is equally portable as that for violin and guitar and it’s for this twosome that Mikołaj Majkusiak has written his five-movement work. Exploiting registers effectively, this is an inherently off-kilter and side-stepping work, its conventional movement headings - Largo, Rondo, Grave etc – cloaking writing that sounds initially doused in Minimalism but that becomes progressively full of vitality, even larkiness. Fortunately, the recording quality is consistently good and, as intimated, the booklet notes are unusually engaging. 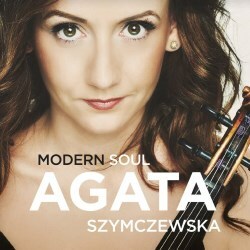 Agata Szymczewska proves a splendid guide to the very different and changeable demands of these four sonatas, abetted by her admirable collaborating artists. The soul of the disc may be modern but it has deep roots.